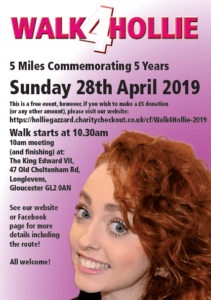 The 2019 #Walk4Hollie will take place on Sunday 28th of April from 10:00am. We aim to start the walk at 10:30am. We will begin and finish the 5 mile walk at The King Teddy pub – which is where Hollie worked. Any one is able to participate for the whole or part of the walk for free, but anyone wishing to make a donation we have suggested £5 to coincide with the distance of the walk and the years passed. Of course, there is no obligation to make the donation, or you are free to donate more if you wish. The Hollie Guard app is offered for free as we want no-one to be unable to have access to this safety tool. But it does come with maintenance costs, so every £5 donation will contribute to the maintenance and development of Hollie Guard. 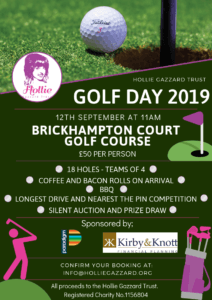 You do not need to be taking part in the walk to donate – you might have downloaded Hollie Guard on your phone, know someone who has or just want to make a donation to the Hollie Gazzard Trust. We look forward to seeing many of you there and would like to thank you all for your support over the last 5 years. 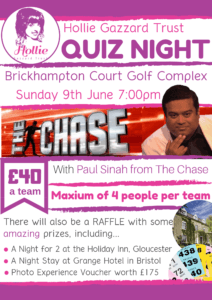 Our quizmaster for the evening will be Paul Sinha aka The Sinnerman from ITV’s The Chase.